Renae Crockford, Nursing Assistant is the Practice Dementia Champion. If you have any concerns regarding Dementia, please book an appointment with Renae who will offer support and guidance. Our vision is for the Vale of Glamorgan to become a community that is committed to supporting and respecting the needs of people with Dementia and their Carers. Dementia Friendly Communities is a program led by the Alzheimer’s Society that aims to create communities across the UK that are inclusive and supportive of people affected by Dementia. The Vale of Glamorgan is in the process of working towards becoming Dementia Friendly. Our aim is to work with local partners and community members across the county to create communities where people affected by Dementia are supported to continue to live well. Barry has been recognised as a Dementia Friendly Community since December 2015, with Dinas Powys, Cowbridge and Penarth all progressing work to becoming dementia friendly more recently. We hope to continue to progress our work to make the Vale of Glamorgan as dementia friendly as possible over the coming years, and we hope that you will be able to contribute in any way you can. Dementia Friends An important aspect of creating dementia friendly communities is to ensure that people are aware of dementia and understand how it can affect people’s lives. Dementia Friends information sessions aims to create better understanding and awareness of dementia. By raising awareness, we also hope to inspire people to act to support people affected by dementia in our local communities. If you’d like to arrange an information session, or find out more about where sessions are being held, please contact us. Western Vale Family Practice is an active member of Dementia Friendly Cowbridge initative. In short, the aim is to create a community that gives a voice to those living with Dementia and supports them to live independetly and well. The aim is for Cowbridge to become a place where people living with Dementia can continue to prosper and enjoy life, safe in the knowledge that the wider community is understanding and supportive of their needs. We have made a commitment to become a Dementia Friendly Town and are now calling on public, private and third sector services to join a social movement across the town that is improving the lives of people affected by dementia. Dementia Friendly Communities is a programme developed by the Alzheimer’s Society which raises awareness about Dementia and encourages organisations, local businesses, community groups and members of the public to share the responsibility for ensuring people with dementia feel understood, valued and able to contribute to their communities. There are over 850.000 people in the UK currently living with dementia. There are an estimated 360 people currently living with the condition around Cowbridge. Dementia is quickly becoming the biggest health and social challenge of our time, so it is vitally important that we all begin to work together to create environments that are inclusive of people affected by dementia, and we can all play a big part in helping to achieve that. Under-diagnosis remains an issue within the Western Vale and across Wales as a whole. The current diagnosis rate in Cardiff and the Vale is approximately 46%, meaning over half of the cases of people living with Dementia are left undiagnosed and are therefore unsupported. Being aware of Dementia will help to reduce the stigma associated with the condition and help people to better identify symptoms, which in turn will improve the diagnosis rate. The best part about it is that people affected by Dementia will be able to feel safe in the knowledge that their needs will be supported by local businesses and the community , and we are all contributing to creating a Dementia Friendly Cowbridge. Cowbridge businesses have begun to sign up as Dementia Friends, to become Dementia Friendly. 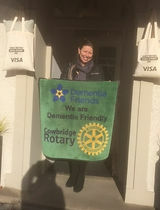 The Cowbridge Dementia Friendly Community Committee is asking individuals and businesses in Cowbridge to be even more considerate of those living with Dementia and their carers. The Committee is running a number of Dementia awareness sessions produced by The Alzheimer’s Society to become a Dementia Friend. Cowbridge Rotary Club is actively supporting the initiative. 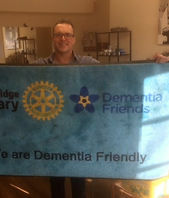 One of its members, Colin Jones has secured the production of brightly coloured mats from Millennium Mats to both record businesses’ support and to demonstrate welcome to those living with Dementia.